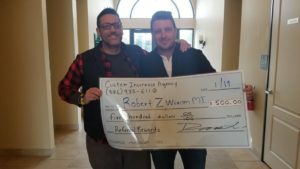 The Referral Rewards Program is a great way to win big! We would like to thank all of those who have referred friends, family, and associates to us for insurance quotes. Referrals provide quality clients who are the foundation of our agency. We have developed the “Referral Rewards” Program to reward our referrers for their continued and appreciated support. 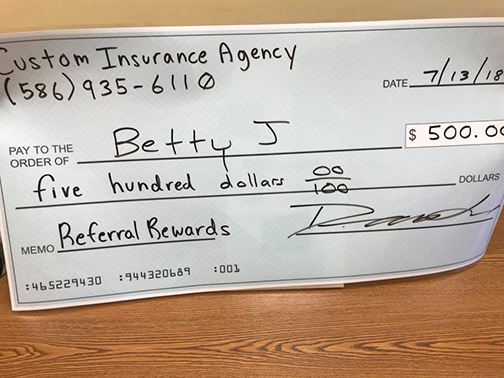 By referring friends or family members to our agency for an insurance quote or financial consultation, you will be entered into our semi-annual “Referral Rewards” drawing for a new HD TV or a $500 VISA gift card. For each referral, there is no purchase necessary and you will receive an additional entry into the drawing. Immediate family of Custom Insurance Agency’s staff are not eligible.